Passenger service: October 1909 - 1957. Existing abandoned portions: Portions of track and track-level platforms, and an entrance at street level in the plaza east of 2 Ave.
Touring: Walk around at street level to see the entrance in the plaza. The car entrance and exit portals can be seen by walking in 59 St and 60 St a short distance east of 2 Ave. The Queensborough Bridge is a cantilever bridge designed by Gustav Lindenthal in 1903 for the City of New York. As opened in April 1909, the upper level had two sidewalks with stringers for a future elevated line down the middle, and the main lower level had a roadway for automobiles across the same space, with a streetcar track on each side, and another streetcar track on each side outside the main bridge trusses. At the Manhattan bridge terminal was an underground loop terminal of five tracks located on the east side of 2 Ave between 59 St and 60 St. The corresponding Queens terminal was a loop of three tracks on the street surface in the bridge plaza on the west side of Jackson Ave (Northern Boulevard). Service was provided by both Manhattan and Queens companies. The Manhattan operator, the Third Ave Railroad System (TARS), ran a line of conduit electric cars from the Hudson River via 42 St, 3 Ave, and 59 and 60 Sts, over the bridge outer tracks to the Jackson Ave terminal, from probably February 1910 to August 1919, when service was abandoned. 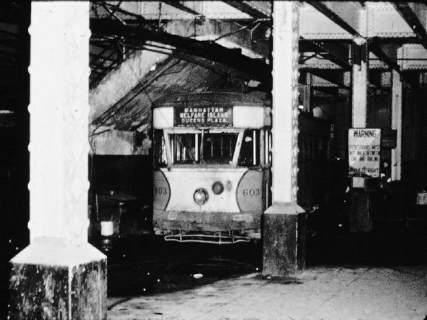 The TARS cars never ran into the underground station at 2 Ave, which did not have conduit track but only trolley wire. The first streetcar service on the bridge was a shuttle of trolley cars started in October 1909 from the underground terminal to the street plaza at the Queens end of the bridge, probably operated by the New York and Queens County Railway. The same company began through service to Queens points in February 1910. The City charged a high price for use of the bridge tracks, and at the expiration of their ten year contracts in 1919, both companies would not renew them. When the Third Ave system cancelled their service, the New York and Queens County was rerouted to the outer tracks, clearing the main lower deck for a roadway without tracks. The New York and Queens County and its successor Steinway Lines continued to operate over the bridge by a series of temporary agreements. In the meantime, a second Queens company, Manhattan and Queens Traction, opened a completely new trolley line over the bridge and out Queens Boulevard to Jamaica, in 1913. The (partial) loop track assignments at the 2 Ave underground terminal are as of 1910. The Corona cars stopped in 1922 when receivership separated the Steinway Lines from the New York and Queens County. The College Point cars were rerouted off the bridge in 1925 to save bridge charges. The other lines remained until general abandonment of the Queens streetcar network in 1937-1939. The Queensborough Bridge Railway however continued past the abandonment of Queens streetcar service. The very last trolley line in the city, it ran just over a mile and a half from the underground terminal at 2 Ave to a street terminal at Queensborough Plaza. 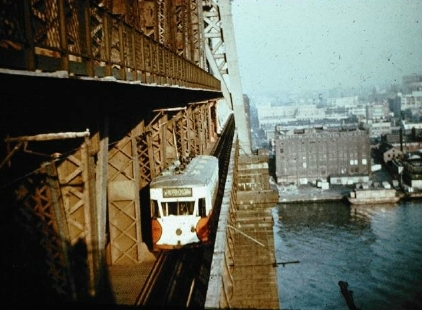 The primary reason it was kept open was the trolley station at the middle of the bridge span over Welfare Island (now Roosevelt Island), which was the only access to the island until a bridge was built from Queens in 1954. The Queensborough Bridge Railway was finally eliminated in 1957. The outboard lanes of the bridge were converted to auto lanes, and the underground terminal was converted to garage space for city vehicles. 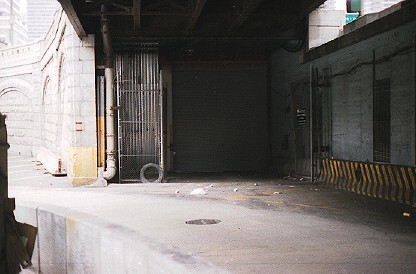 When the Roosevelt Island housing development was started, access from Manhattan again became important, but the trolley was too long gone to be restored. 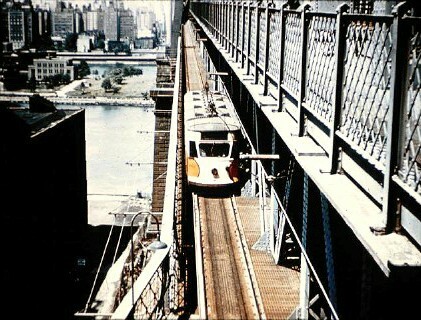 A cable suspended tramway was built instead from the west side of 2 Ave, right across from the underground terminal, running along just north of the bridge to a terminal on Roosevelt Island. 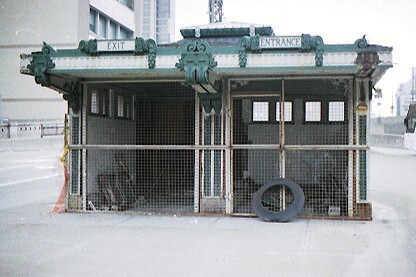 The cable tramway was to have been removed once the new subway was open with its Roosevelt Island station (1988), but it continues in service. A monorail line was proposed in 1995 to link Manhattan to the two Queens airports. For about a year, the plan was to run it out of the underground terminal and across the Queensborough Bridge outboard roadways. 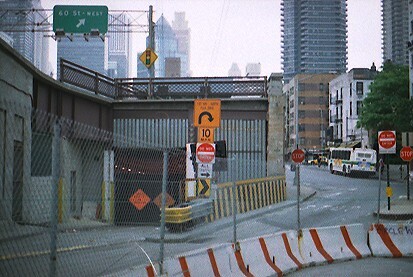 Use of the existing East River crossing and avoidance of further running in Manhattan was intended to keep down costs. The terminal is not well sited, however, because taxi and other surface transportation is compromised by the heavy traffic on and off the bridge, and there is no subway station nearby. 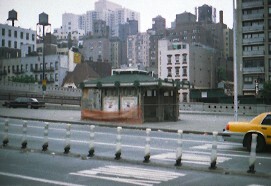 In July 2003, the city's Transportation Department asked the Landmarks Preservation Commission for permission to move the kiosk away from the bridge plaza. Vehicles had crashed into it three times in the past five years. The Transportation Department have also claimed the other existing kiosk, which has served as an entrance to the Brooklyn Children's Museum for about 30 years but will be surplus because of renovations there. The underground loop terminal is located east of 2 Ave, under the bridge plaza. The former trackways in and out are now the roadways on the outside of the main bridge trusses, one lane on each side of the bridge. Bridge local cars stand inside the cramped and somewhat deteriorating terminal sometime between 1939 and 1957. The double-ended cars looped here, but reversed direction at the Queens end. Top, the rear destination sign of car 603 reads MANHATTAN - WELFARE ISLAND - QUEENS PLAZA. The notice board begins PEDESTRIANS MUST NOT... something. 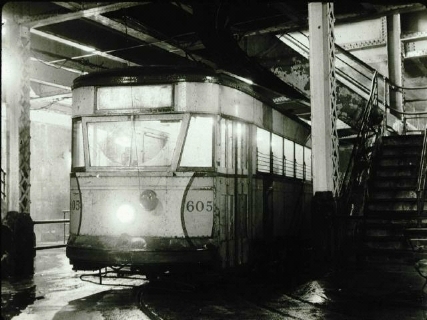 Bottom, car 605 waits to depart toward the camera on a rainy day, or perhaps that is dirt on the windshield. Both: Source unknown, David Pirmann collection. Trolleys from Queens came down what is now the pedestrian lane on the north side of the bridge. The track ran straight into the portal of the terminal. The modern bus veers right to (below) an allotted length of curb on 60 St. 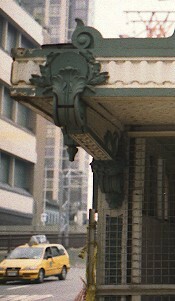 The remaining kiosk in the bridge plaza stands near its original location. 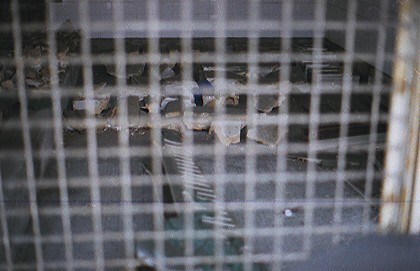 Parts are missing or broken, and it has no stairways within, just a solid concrete floor, but someone has given it a fresh paint job, and some of the needed parts are on the floor inside the locked gate. 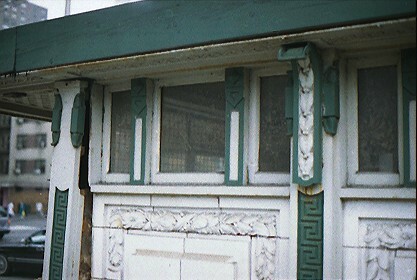 The damaged rear wall is the result of the kiosk being struck by cars or trucks. The tracks ran outside the main bridge structure, and the two stations provided favorite places for photographers. Top, a car leaves the Welfare Island station for Queens. 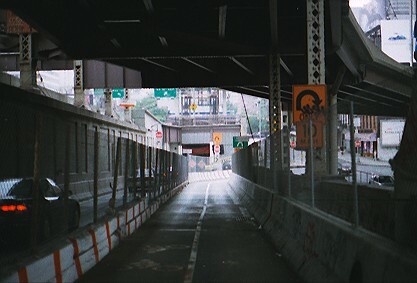 Bottom, a car approaches the Vernon Boulevard station, with Welfare Island and Manhattan in the background. Both above: Source unknown, David Pirmann collection. 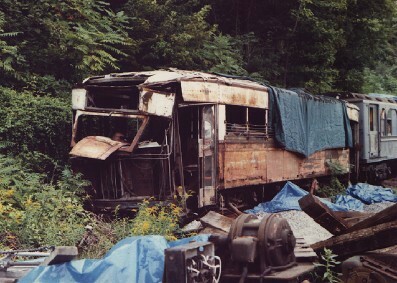 Below, the last survivor of the bridge cars was rotting away at the Trolley Museum of New York in Kingston in 1989. Excerpts from the Red Book guide to Queens of 1923 show the early streetcar service to the terminal, identified here as 2 Ave and 59 St. Manhattan and Queens Traction ran a bridge shuttle as well as their Queens Boulevard route. The book fails to show the 1922 changes on the New York and Queens County system: the Corona line no longer ran over the bridge, and the rest had become part of the Steinway Lines. By 1934, shown in excerpts from a Geographia Street Guide to Queens, only three carlines still operated over the bridge.